When It Comes To Hearing Technology: One Size Does Not Fit All! By Jessica M. Bell, Au.D. What hearing aid style is right for you? Although there are a variety of sizes and styles available to choose from, your audiologist can help you choose the style that is best for you and your hearing. It is a common misconception that size equals price. That is not true. The technology inside of the hearing aid is what determines the price of the instrument. The style of the instrument is purely a visual preference and can come in a variety of technology levels. When it comes to styles of hearing instruments, there are three main categories: Behind-the-ear (BTE), In-The-Ear (ITE) and Receiver-In-Canal (RIC). While most hearing aids today are typically highly durable and water resistant, each style of instrument offers different benefits to the patient. Below is a review of the benefits of each style. It is important to note that you should speak with your audiologist to determine which style of instrument is best suited for you based on your hearing test results, dexterity, and overall listening lifestyle. The BTE style hearing aid is designed to sit, well, behind the ear! This type of hearing instrument houses all of the technology behind the ear. The sound is delivered to the ear via a tube. Depending on hearing thresholds, the tube size may vary. The hearing aids are anchored into the ear via an earmold or a dome. The BTE is a popular device because it can deliver high levels of sound to a patient, if needed. The ITE style hearing aid is a hearing aid that is made custom to each individual patient via an impression taken of the ear in the office. An ITE instrument is available in a variety of sizes. The size of the ITE instrument is selected based on hearing thresholds, dexterity, and desire for controls (i.e. program button, volume control, etc.) or wireless connectivity. If dexterity is a concern, an ITE hearing instrument tends to be easier to place in the ear as it is only one piece. Similar to the BTE, the RIC also sits behind the ear. This style of instrument is anchored onto the ear via dome or custom earmold. The difference between a BTE and a RIC is that the receiver (i.e. speaker) actually sits in the ear canal in a RIC instrument. The additional components remain behind the ear. By allowing the receiver to sit in the ear canal, the body of the device can become even slimmer and more discrete. The wire leading from the instrument to the speaker is very thin and almost invisible as it enters the ear canal. The RIC instrument allows for some sounds where hearing is normal to be transmitted naturally while amplifying those pitches that need enhancement. Additionally, if hearing loss progresses, the ability to change to a stronger power receiver is much more readily available and can be done quickly in-house. This is a brief overview of the different style hearing instrument options available to help you feel more confident when choosing. Write down what is important to you and remember your audiologist is there to assist you in your selection! No matter what style you choose, the audiologist will make certain to program the instrument giving you maximum audibility for hearing speech. 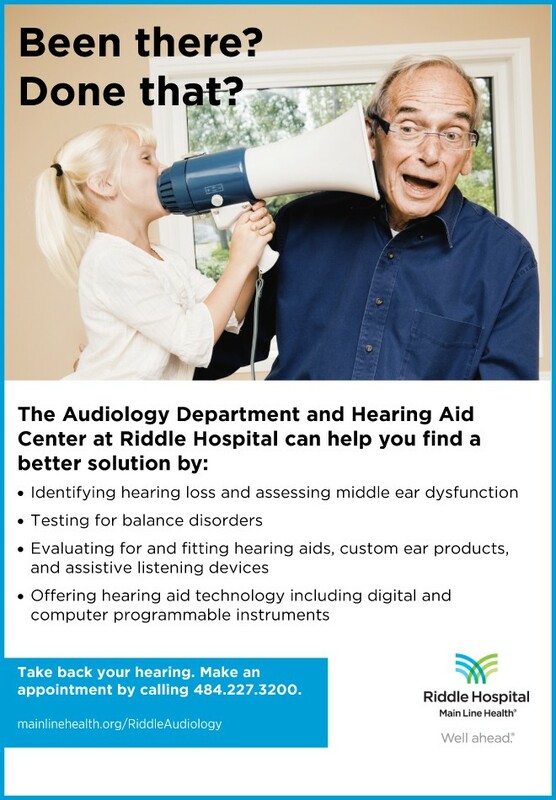 The audiologists at Riddle Hospital share the same goals that you do – to improve hearing and understanding even in your most difficult listening environments. A comprehensive audiological evaluation followed by a listening needs assessment and live hearing aid demonstration will allow the audiologist to make the best recommendations for a hearing treatment plan tailored to your listening needs.